Testimonials – RBH Insulation, Inc. I went in to buy some materials for soundproofing and a woman named Valli went out of her way to help me solve my problems and was very helpful and knowledgeable. Couldn’t have gone better. We worked with [an RBH representative] to estimate and complete the job. He was extremely helpful and responsive, both by phone and by email. The crew was friendly, fast, and professional. And the price was very competitive — even though we have a complicated skylight box they had to custom wrap. All in all a very good experience. Would definitely recommend them to anyone needed their services. [RBH Insulation worked] quickly, efficiently and everything [was] cleaned up afterward. I would hire them again. Your company recently installed insulation throughout my house. You were highly recommended by at least three contractors. I [had] never heard of your company before, but I was impressed by the consistent recommendation. Your salesman…was excellent. He was on time, thorough and professional. He was the face of your company and he did an awesome job. With all that said, you have a great reputation and you also have one more customer telling everyone to call RBH if they need insulation. RBH made it easy to update our attic and subfloor insulation. From the writing of the bid through the last clean up, they were professional, courteous and timely. I’d use them again in a heartbeat. The crew just finished. They were on time, completely professional and friendly. Just like everyone at RBH Insulation. My wife and I are both very happy we went with your company. Thank you all. I am pleased to provide this letter of endorsement for the work done by your company at our home earlier this week. After evaluating a number of potentially qualified contractors, and following up with interviews and discussions of our specific requirements, we felt confident in selecting RBH Insulation for the job. You possess a wealth of valuable experience and perspective with respect to what works and what doesn’t and, with equal importance, you conveyed a willingness to work closely with us to ensure our satisfaction. This was amply demonstrated by your crew in re-insulating our attic. Their excellent workmanship and attention to detail were impressive. David Moore was very knowledgeable and thorough with regard to what he thought was best in our situation and his proposed materials for the project. He followed up on items I had questions about in a timely manner. He made sure that I was comfortable with his proposal, his plans for the project, and the fee. Your crew went the extra mile to ensure our complete satisfaction. This was especially important because the project was in our own home. You treated our home as if it were your own, minimizing the disruption and instilling in us a sense of confidence in recommending your company to friends and family. Joyce and I would like to express our sincerest thanks to you for your meticulous workmanship and for the dedication that you applied to ensure our full satisfaction with your work. Please feel free to use this letter as a reference to the high quality of your work and exemplary services of your staff. Thank you again, we look forward to working with you in the future on other home improvement projects. 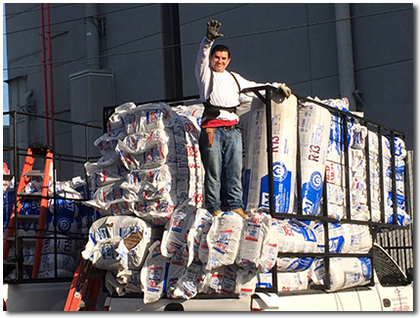 RBH Insulation has been our go-to company for years. Excellent service, excellent price and top-notch people. Contact Us about your project and you could be as happy as these customers.